Complying with the GDPR will help you market to your prospects and customers better, and get more jobs. Wait, what? How can the act of protecting customer data—and even deleting prospects from your email list—help you win more work? We researched the marketing effects of the GDPR and discovered some interesting surprises. 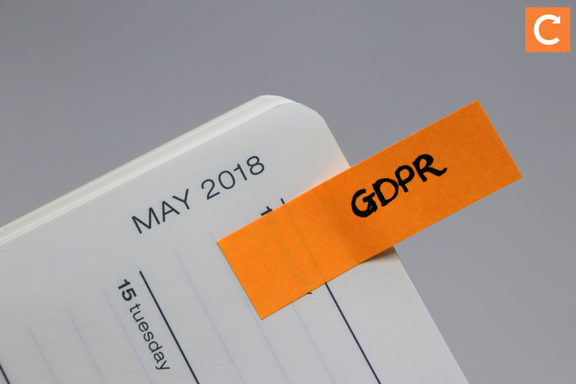 How can the GDPR help you get more jobs? Your data will be cleaner. You get one more ‘marketing touch’. A higher percentage of subscribers will see your emails. Being transparent with your customers creates trust. You have more time to focus on your best customers and prospects. You improve the customer experience. GDPR compliance is a marketable benefit. Let’s talk detail on each one of these. 1. Your data will be cleaner. Sending marketing messages to people who aren’t interested is a bad idea: When recipients complain about your emails, your email marketing system may brand you a spammer. With the GDPR, you can send marketing emails only to people who have opted in. This means you probably have some list cleaning to do, which will take care of those problems we just mentioned. Remember, it’s not the size of your list that matters, but the quality; better to have 500 people who want to be there than 50,000 people who don’t. 2. You get one more ‘marketing touch’. If you conduct a ‘permission passing’ campaign to get your existing list members to opt in, this is an opportunity to reach out to your prospects one last time. Pull out all the stops in this re-engagement email: Use personalisation, stress the benefits of hearing from your company, and show recipients your mad GDPR skills. The Social Effect website has a good article on how to construct and manage your permission passing campaign. 3. A higher percentage of subscribers will see your emails. Sending email to people who aren’t interested skews your numbers so you can’t tell exactly how your email campaigns are faring. If you never clean your list, you probably get a lot of ‘hard bounces’ from fake emails and ‘throwaway addresses’—which are email addresses that people use only to sign up for lists, and that they never check. Once you clean your list, you can say goodbye to all those fake addresses and throwaway emails, meaning you’ll see the open and click-through rates on your marketing campaigns soar. 4. Being transparent with your customers creates trust. Allowing your customers to control their information, and letting them access the data you collect on them, makes them feel more confident in handing over said data to you. Also, getting your GDPR compliance in order shows you’re a trustworthy field service business. 5. You have more time to focus on your best customers and prospects. The less time you spend marketing to people who just aren’t that into you, the more time you have to spend on the ones who are open to your offerings. Ever hear of the Pareto Principle? Here’s an Entrepreneur article on how it works in business, but In short, it’s the concept that 80% of an effect comes from 20% of the causes. In this case, 20% of your customers probably account for 80% of your profits. 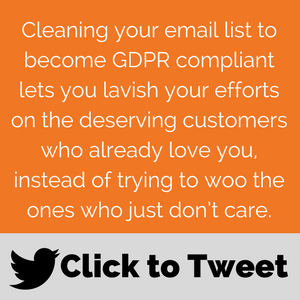 Cleaning your email list to become GDPR compliant will let you lavish your efforts on that deserving 20%, instead of trying to woo the ones who simply don’t care. Again, it’s about quality over quantity: There’s also the 20% of your email list subscribers who are responsible for 80% of your headaches. Wouldn’t it be nice if your GDPR list-cleaning got rid of them? 6. You improve the customer experience. 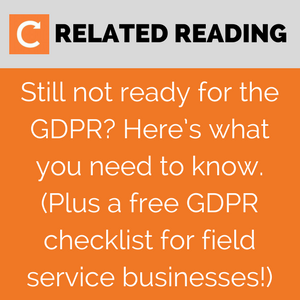 From the standpoint of the field service business, the GDPR is all about improving your customers’ experience of working with you. When your business is fully compliant, prospects can sign up for your email list knowing they have full control over their data—and customers can take comfort in the fact that you’re doing everything you can to protect their information. 7. GDPR compliance is a marketable benefit. Don’t forget that GDPR compliance is a brag-worthy accomplishment on its own! Be sure to let your customers know everything you’ve done to protect their data. Try sending an email to your (newly cleaned!) list, and posting about your GDPR win on social media. Becoming GDPR compliant helps with your marketing—and so does having a customer-grabbing website. So we created Build a Better Website: A Complete Kit for Field Service Businesses, which offers simple SEO tips, a guide on how to bring in customers with a blog, and much more. Just click the banner below to download your free Kit.